UNITED NATIONS, July 18 -- What has been the impact of the Contact Group on Libya last week deeming the National Transitional Council as the legitimate government? Inner City Press: with the decision by the Contact Group to recognize the National Transitional Council as essentially the Government of Libya, I wonder [what] that changes. I know that the UN Secretariat gave these courtesy passes to former Ambassador Shalgham and his deputy, Ibrahim Dabbashi. But then it imposed some conditions that they couldn’t speak at the stakeout, but they could come into the building. Does the Contact Group decision about who is the legitimate representative of Libya change anything about the Secretariat’s decision on these two diplomats that have gone to the Benghazi side? Spokesperson Nesirky: Not to my knowledge, because the Contact Group is not responsible for recognizing or otherwise. Inner City Press: Could we get Ian Martin? Is it possible, given Ian Martin’s now even more prominent role in this, you know, transition in Libya, to have him either do a stakeout or come to the this room just to describe what his work is and where it stands? Spokesperson: We can certainly ask. So far, nothing. Watch this site. A question put to the IMF's spokespeople on Monday, whether the Contact Group's decision changed in any way the Bretton Woods institution's previous stance of not working with the National Transitional Council has so far not been answered. It will be asked at the IMF's next briefing. 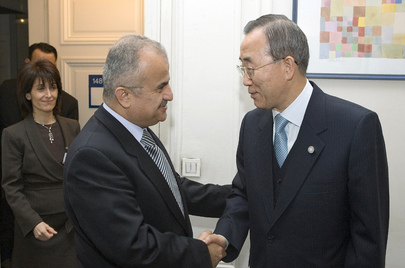 UNITED NATIONS, July 12 -- The UN's engagement on Libya has come slightly more into focus, though still vague on money. On Monday, the UN Secretary General Ban Ki-moon's envoy on Libya Abdul Ilah Al-Khatib told Inner City Press that he is still a “proud” Senator in his native Jordan, and works for the UN only as a volunteer. Inner City Press: At the stakeout yesterday, Mr. [Abdul Ilah] al-Khatib clarified and said he is now, he is a volunteer and remains a senator in Jordan. And I just, I don’t want to belabour it, except to say that some say there is still kind of a… the issue of serving both the UN and a Government at the same time, they’re not sure there is a precedent for that and think that OLA [Office for Legal Affairs] may have criticized it. And also I wanted to know whether in fact he’s flown, requests or demands a UN plane to fly from Jordan to various meetings not in Libya and also has UN staff in Jordan. What’s kind of the cost and what’s the… is the thinking, if he doesn’t personally receive a salary, there is no possible conflict of interest with being a sitting politician in a country in the region? Spokesperson Nesirky: Well, I think Mr. Al-Khatib can speak for himself on that particular topic, and evidently did so yesterday. That’s the first thing. Second is that, of course, a special envoy working on a topic as high profile and complicated as this one could be expected to have people supporting him from the Department of Political Affairs, and that is certainly the case. Inner City Press: his staff is someone that worked for him in the past? Was it a UN staff member forwarded to Amman? ... Is this a new trend? Spokesperson: Well, let’s not extrapolate from one particular case. This is an important role that Mr. Al-Khatib has and is carrying out. He is widely respected in the region; he knows the players in the region and evidently has access to them, too. And that’s clearly, in the present circumstances, rather important. He obviously also needs to travel, not just to Libya but to other countries in the region. And another one would be, for example, the Contact Group meeting that’s going to take place in Istanbul. That’s quite normal and understandable for someone who is working on a topic in a role where he is precisely supposed to be coordinating and liaising between different groups and seeking to mediate a solution to this crisis. Spokesperson: I’d need to check what planes are used, if any. I would need to check on that. I don’t know the answer. Seven hours later, no answer had yet been provided. Regarding your questions from last week, we can confirm that Dirk Vandenwalle is working with Ian Martin's team dealing with the transition in Libya. He was hired as a consultant. But as what cost? And as some wonder, why would a Special Adviser need Political Advisers? Watch this site. UNITED NATIONS, July 7 -- During an hour-long meeting of the Libya Sanctions Committee of the UN Security Council behind closed doors on Thursday afternoon, France's admitted dropping of weapons into Libya's Nafusa Mountains was criticized by Council members including Russia, South Africa and India, as violating the arms embargo in Resolution 1970. The representative pointed to paragraphs 13-16 of Resolution 1970 and said that if France thought that its provision of weapons into Libya was legal, it had a procedure to use, but didn't. Inner City Press asked Russia's Deputy Permanent Representative what had been accomplished in the meeting. Pankin distinguished between interpretation -- “legal stuff” -- and the practical, that objections were voiced and “I hope we will not have such a [case] again, that's the most practical.” We'll see.